Q1：Have you received the complaint of Gao et al. Nat. Biotechnol 34, 768-773 submitted by these Chinese scientists? A1：We cannot comment on specific feedback received but we can confirm that we have received numerous communications relating to this paper and have considered or are considering them carefully. 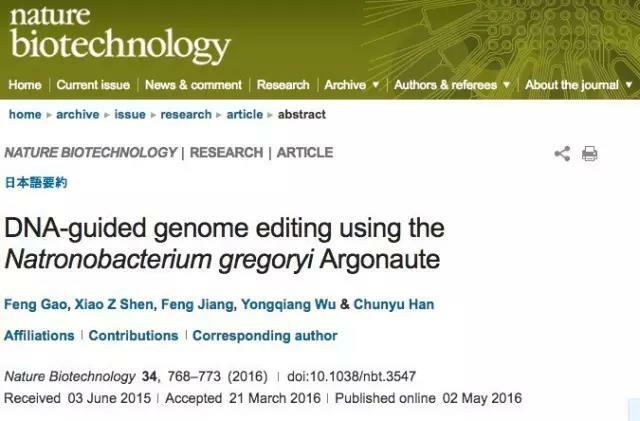 In general, critical comments of Nature Biotechnology papers may, after peer review, be published. Correspondences are exceptionally interesting or important scientific comments and clarifications on original research papers or other published peer-reviewed material and they are published alongside a response from the original authors (if they choose to provide one). Correspondences are linked bidirectionally with the original published paper. Some submitted criticisms are so significant that they lead the authors or editors (with the assistance of peer reviewers) to conclude that the fundamental conclusions of the paper are invalid. In these cases a paper would be retracted. Correspondences may be published alongside retractions if it is important to highlight and clarify issues in the original paper. Q2： What does Nature Biotechnology think of this complaint? Will Nature Biotechnology start a peer review of this complaint? If so, will Nature Biotechnology disclose the conclusion? A2: Nature Biotechnology takes all complaints and concerns raised with the journal seriously and considers them carefully. As described above, where appropriate, we will publish Correspondences alongside published papers. We take our responsibility to keep published literature up to date seriously, but no two investigations are the same and investigations can take a considerable length of time. It is important to allow them to run their course and not prejudge the results, as accusations may or may not be proven to have foundation.